"A single kind of blue-green algae in the ocean ('Prochlorococcus') produces the oxygen in one of every five breaths we take." "How Our Fate and the Ocean’s Are One"
"I see things that others do not..."
How Tiny? A Big Single Cell? Take a closer look at a Single-Cell "Acetabularia"
1) Discuss Earth’s oxygen resources. Lush tropical rainforests, green prairie pastures and other soil-bound vegetation have long flourished in the ecological limelight. Now the other half of the planet is about to enjoy its day in the sun. Science estimates over half of the world’s oxygen supply is produced by tiny microbes that live in the sea. And researchers sequencing their genomes have turned up some surprising results... "Photosynthetic organisms in the ocean are as important as photosynthetic organisms on earth... The organisms in the ocean are much less impressive than trees in terms of size, but are extremely important to the biosphere, and preservation of life as we know it." Tiny marine plants produce a significant fraction of the oxygen we breathe... the thin blue layer of atmosphere with its life enabling oxygen is the result of tiny blue green marine life. One Strange Rock... Diatoms, microalgae are a secret to the Earth's oxygen supply... ... By producing and releasing oxygen (as a byproduct of photosynthesis), Cyanobacteria are thought to have converted the early oxygen-poor Earth atmosphere into an oxidizing one, causing the "Great Oxygenation Event"
What's Happening Now with the Tiny Blue-Green Ocean/Sea Life? Researchers have found that ocean temperature... determines what sort of communities of (plankton) organisms we find. If we look at our data and we see what organisms are there, we can predict with 97% probability the temperature of the water they are living in. "These organisms are most sensitive to temperature, more than anything else, and with changing temperatures as a result of climate change we are likely to see changes in this community." The researchers say that this scientific analysis is just the beginning. Scientists are making their findings freely available to the scientific community to gain a better understanding of this vital but unseen underwater world. "The amount of data released is already enormous; it is one of the largest databases of DNA available to the scientific community. Scientists have analysed perhaps 2% of the samples collected throughout the world - so there is a huge amount of work to do in the future to understand even more about the functioning of these marine ecosystems and the importance of that for the well being of the planet. Rising temperatures and precipitation driven by climate change would trigger heavy runoff into oceans and the resulting pollution will shoot up mercury levels in all oceanic creatures and harm the food chain. The new study said the impact will be quite high on the bottom level zooplanktons, fish, and to humans who consume the fish. The mercury levels are expected to rise seven times the current rate. It said zooplankton will see a massive spurt in toxic mercury by 300 to 600 percent if runoff goes up by 15 to 30 percent triggered by higher rainfall. The research traced the new route by which the rising warming would shoot up mercury toxin levels in sea creatures. Rising rainfall would drive up the amount of organic material flowing into the sea and will add serious implications on the food chain by the addition of an extra layer of organisms to the chain. "When bacteria become abundant in the water there is also a growth of a new type of predators that feed on bacteria," said lead author Erik Bjorn of the Umea University in Sweden. That is like adding a new step in the food chain and methylmercury being enriched to a bigger factor in the food web. For humans, exposure to high mercury content will be from eating fish containing methylmercury, which is generated by the reaction of bacteria with mercury in water, soil, or plants. The toxic methylmercury is very harmful to nervous, digestive, and immune systems. The study also said, in a climate scenario of rising temperatures, the organic matter outflow into seas will increase by an average 15-20 percent by the close of the century. Correspondingly, the methylmercury levels in zooplankton will zoom by seven fold. The worst hit by the "mercury invasion" will be coastal waters and lakes the Northern Hemisphere with sharp increases of methylmercury in fish. Marine Algae: The Most Important Organism? • -- Phytoplankton obtain energy through the process of photosynthesis and must therefore live in the well-lit surface layer (termed the euphotic zone) of an ocean, sea, lake, or other body of water. • Phytoplankton are responsible for most of the oxygen present in the Earth’s atmosphere – half of the total amount produced by all plant life. Cyanobacteria are arguably the most successful group of microorganisms on earth. Cyanobacteria are the most genetically diverse; they occupy a broad range of habitats across all latitudes, widespread in freshwater, marine, and terrestrial ecosystems, and they are found in the most extreme niches such as hot springs, salt works, and hypersaline bays. Photoautotrophic, oxygen-producing cyanobacteria created the conditions in the planet's early atmosphere that directed the evolution of aerobic metabolism and eukaryotic photosynthesis. Cyanobacteria fulfill vital ecological functions in the world's oceans, being important contributors to global carbon and nitrogen budgets. [Diatoms are] among the most common types of phytoplankton. Diatoms play an important role in biogeochemical earth because they contribute an estimated 75% of primary production in coastal waters... There are more than 200 genera of living diatoms, and it is estimated that there are approximately 100,000 extant species. GP360: The standard approach, when looking at threatened species, is to focus on well-known larger species. The Red List is widely known for its work to identify species at risk of extinction. Its work forms a basis for many biodiversity preservation efforts. The Red List also focuses on larger, readily identified animals. Yet these species, often mammals among millions of other smaller, lesser known and unknown species, reveal just a fraction of a much larger picture of our threatened environment. The best known endangered and threatened species, often considered 'charismatic' or 'iconic' species, have had a featured role in a first era of environmental and wildlife preservation efforts. The reality is that much of the extinction in our era is of the small species, the lesser known, unknown and unconsidered species, whether in the rich biospheres of the rainforests or the oceans, the micro-organisms, the support systems of life and the branches and roots of the Tree of Life are at risk and in peril of collapse. As planet citizens, planet scientists we need to shift to seeing and protecting the bigger, inter-related and inter-connected communities of species. When we speak of Plankton, we are speaking of a profoundly critical keystone species that enables life. The food chain of the oceans begins with Plankton, and the disruption of the atmosphere and the heating of the ocean, and acidification, will have spiraling consequences to the Phytoplankon and all the species that depend on Plankton as a key source of food throughout the oceans of the world. These small 'non-charismatic' creatures/species are flagellates who cannot move with their limited locomotion system... As oceans heat and acidify, the Plankton populations are greatly impacted. Increases in ocean heat and/or strengthened suns UV rays/radiation due to changes in atmospheric conditions can have deadly consequences to the 'least of and smallest of' the species. Larger inter-connected systems in are being impacted in ways that science is only now beginning to measure and monitor. We are, our species is, beginning to understand that as the small animals comprising the foundations of the 'food chain' and biosphere systems are disrupted, endangered and/or destroyed, the rest of the food chain and integral ecological connections between species will be disrupted, endangered, and/or destroyed. A biodiversity preservation efforts in the coming second era of environmentalism, utilizing scientific data more extensively, needs to become a goal of environmental organizations. It will not be easy to shift from the polar bear to the 'tiny little ones' (who can be exceedingly 'ugly') but, as the actor Jeff Goldblum says in Jurassic Park, "there it is." The understanding of and protection of biodiversity, large and small, easily recognized and difficult to recognize, is a great challenge of the era in which we live... loss of biodiversity is producing a 'ripple effect' over time, a threat multiplier that demands strategic environmental security as a key goal, a green policy objective beginning with awareness and policies and practices of sustainability. Phytoplankton obtain energy through the process of photosynthesis and must therefore live in the well-lit surface layer (termed the euphotic zone) of an ocean, sea, lake, or other water. Phytoplankton are responsible for much of the oxygen present in the Earth’s atmosphere – half of the total amount produced by all plant life. Via ScienceDaily / 2010 — In an unprecedented effort published online by the international journal Nature, a team of scientists mapped and analyzed global biodiversity patterns for over 11,000 marine species ranging from tiny plankton to sharks and whales. The researchers found striking similarities among the distribution patterns, with temperature strongly linked to biodiversity for all thirteen groups studied. These results imply that future changes in ocean temperature, such as those due to climate change, may greatly affect the distribution of life in the sea. Ocean Temperatures: Are our oceans dying? Via National Center for Atmospheric Research: "Loss of oxygen in the ocean is one of the serious side effects of a warming atmosphere"
The food chains of the world’s oceans are at risk of collapse due to the release of greenhouse gases, overfishing and localised pollution, a stark new analysis shows. The paper, published in the Proceedings of the National Academy of Sciences, found there was “limited scope” for animals to deal with warming waters and acidification, with very few species escaping the negative impact of increasing carbon dioxide dissolution in the oceans. Phytoplankton are the grass of the sea. They are floating, drifting, plant-like organisms that harness the energy of the Sun, mix it with carbon dioxide that they take from the atmosphere, and turn it into carbohydrates and oxygen. Phytoplankton are critical to the marine food web, being the primary producers of food for the oceanic food web, from zooplankton to fish and shellfish to whales. Like plants and trees on land, phytoplankton give us a lot more than food. It is estimated that 50 to 80 percent of the oxygen in our atmosphere has been produced by phytoplankton. At the same time, they are responsible for drawing down significant portions of the carbon dioxide from the air. The tiniest of living organisms exert an outsized influence on the planet. Earth's climate could be shaped by some of the smallest known free-living bacteria, new research suggests. While studying the bacterial group Pelagibacterales, the most abundant organism at the ocean's surface and one of the most abundant across the entire globe, scientists found that they are involved in an integral process that helps regulate our climate – the production of dimethylsulfide (DMS). As reported in the journal Nature Microbiology, researchers observed two gases being produced by the Pela ocean bacteria: DMS and methanethiol. More critically, "DMS is involved in cloud formation, forming a critical link in a negative feedback loop known as the CLAW hypothesis: Sunlight stimulates the production of phytoplankton, which in turn produce dimethylsulfoniopropionate (DMSP). Other microbes break this down to form DMS, which boosts the formation of clouds, reducing the amount of sunlight that reaches the ocean." "Here's what I think is important," according to study researcher Dr. Stephen Giovannoni of Oregon State University. "We're studying the most abundant organism in the ocean surface and we've discovered an unusual mechanism that produces DMS.... Ultimately the question is how are compounds made by this organism affecting the climate?" Seagrass ecoregions, which are increasingly threatened, "provide a spectrum of services to humans, including sequestering millions of metric tons of carbon each year, protecting shorelines, providing nurseries for marine life, contributing to global food security, supporting biodiversity and keeping ocean water clean..."
Cloud-Aerosol Lidar with Orthogonal Polarization (CALIOP) aboard the Cloud-Aerosol Lidar and Infrared Pathfinder Satellite Observation (CALIPSO) satellite measures plankton levels from space in all weather... through clouds, continuously monitoring this essential 'blue-green' ocean resource. Michael Behrenfeld from the Oregon State University's College of Agricultural Sciences explains the importance of the earth science research from the mission. "It's really important for us to understand what controls these boom-bust cycles and how they might change in the future, because the dynamics of plankton communities have implications for all the other organisms throughout the web." Phytoplankton also influence Earth's carbon cycle. Through photosynthesis, they absorb a great deal of the carbon dioxide near the ocean's surface. That, in turn, allows carbon dioxide from the atmosphere to go into the ocean. The satellite-mounted LIDAR instrument, dubbed Cloud-Aerosol Lidar with Orthogonal Polarisation (CALIOP), uses a laser beam to map the ocean's surface and immediate subsurface. The results of the CALIOP/CALIPSO mission are providing the first continuous look at the boom-bust cycles of polar phytoplanktons - microscopic marine plants that are the foundation of the ocean's food web. >Researchers at Canada's Dalhousie University say the global population of phytoplankton has fallen about 40 percent since 1950. That translates to an annual drop of about 1 percent of the average plankton population between 1899 and 2008. >"In some respect, these findings are the beginning of the story, not the end," Boyce said. "The first question is what will happen in the future. We looked at these trends over the past century but don't know what will happen 10 years down the road." >The study "makes a sorely needed contribution to our knowledge of historical changes in the ocean biosphere," said David Siegel of the University of California, Santa Barbara, and Bryan Franz of NASA in an essay, also published in Nature. 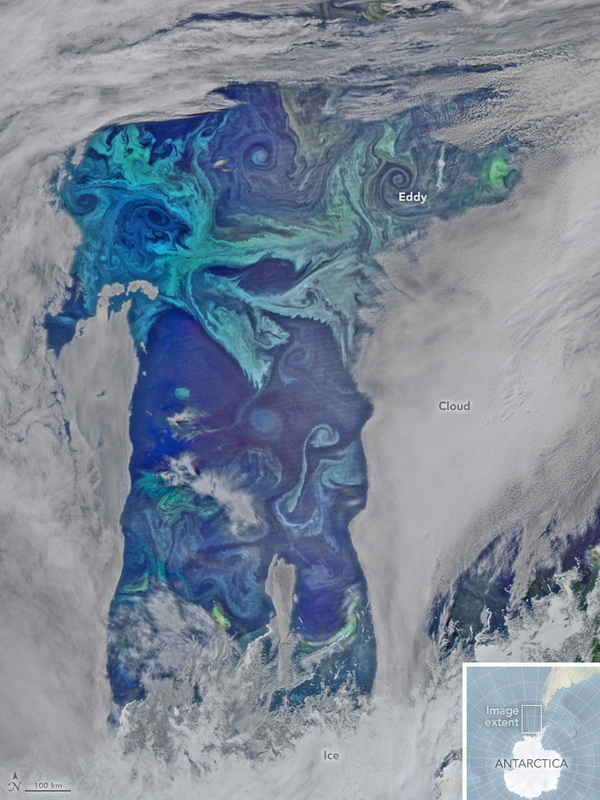 >"Their identification of a connection between long-term global declines in phytoplankton biomass and increasing ocean temperatures does not portend well for [ocean] ecosystems in a world that is likely to be warmer." "Phytoplankton productivity is the base of the oceans food web...."